Holsters available for the CZ series can be categorized in having four primary roles: Duty holsters, concealment holsters, tactical holsters, and sporting holsters. Choosing the right holster for your CZ pistol is as important as picking the right handgun that suits your needs. A CZ holster will not fit every CZ pistol so it is important to find the one that perfectly fits your particular CZ firearm. It’s recommended to take the gun with you when going to purchase its holster. In general, good holsters are considered to have two primary functions. First, they come in handy for tactical purposes and second, they allow concealability for the firearm. Both these features are central to the making of a good holster. A perfect fit for CZ 75(B), the BlackHawk Serpa CQC holster has one of the best combinations of concealment and tactical combat. Overall, its most salient features include smooth draw, paddle availability, exceptional firearm security, good concealment and an active retention retention system. The BlackHawk Serpa CQC is a superb blend of security, easy draw, and concealment, rendering the product very useful for tactical use. The holster fits well with CZ pistols, especially CZ 75(B). 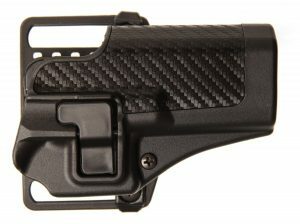 It features a unique speed-cut design that allows smooth reholstering and secures the firearm firmly. Moreover, the holster self-adjusts so as to facilitate easy draw which is why it makes the perfect Level 2 retention holster. Concealed carry is further aided by SERPA’s cut-down body and tapered trailing edge design. 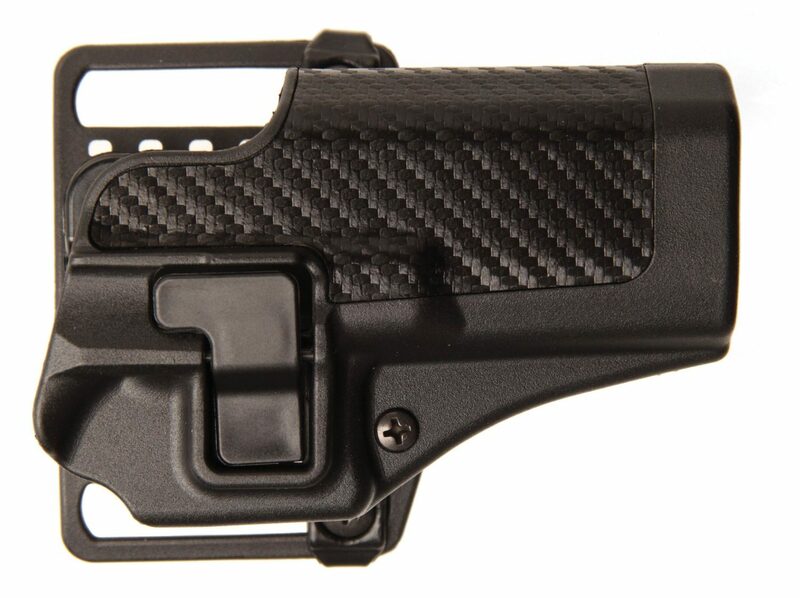 A carbon-fiber body makes the holster exceptionally strong yet lightweight. Sits close to body. Could be improved if muzzle end were closed. The pistol not only remains very secure in the holster (which snaps with an audible click), but is easy to access and draw when needed. The rock solid paddle adds to an alternative carry option. Its cleverly designed hook coupled with just the right pressure makes the rig seem like it is attached to the belt. The BlackHawk also comes with a belt loop bracket and a paddle bracket, offering other options to carry your firearm. The thought of paddle bracket might repel you from the BlackHawk because most paddle brackets dig into your thighs when you sit. However, this one is extremely well-rounded and does not pose any such problem. In fact, you might not even notice it’s there. The BlackHawk is easy to assemble. You have two options, either install the belt-loop system or the paddle. Having the paddle on is quite comfortable. The firearm stays secured inside the waistband with the help of an internal hook which connects the holster to your belt. You might assume that putting on the paddle is a hassle. In contrast, strapping on is extremely easy and takes a matter of seconds without having to undo your trousers or even your belt. Switching between the paddle and the belt loop attachments is fairly easy. All you have to do is remove 3 screws. However, please keep in mind that if you switch too often, use a mild to medium thread lock to make sure that the screws don’t loosen up with time and holster use. Keep checking how tight the screws are every week or two. BlackHawk has a feature that allows you to adjust cant and passive retention screw according to your preference. The release button, on the other hand, could take a little getting used to given the forward-cant thumb break. Make sure you keep practicing drawing your firearm from the BlackHawk so that you get the hang of it when the need arises. Gun looseness can be fixed by tightening the screw in front of the trigger guard. This will bring the holster’s back closer around the trigger guard fitting it nicely. Apart from that, you can also replace the spring in front of the trigger guard with one that exerts some tension on the firearm, going deeper into the holster and under the barrel. Furthermore, the non-SERPA holsters include a bigger spring which you can get (usually for free) if you request BlackHawk and complain that your gun is rattling inside the holster too much. The SERPA active retention system comprises of a plastic L-shaped lever that serves as both the release button and the lock. The lock engages inside the trigger guard and the shorter leg pivots inward towards the pistol whereas the locking tab pivots outward, ensuring a smooth and steady release of your firearm from the holster. One potential concern using this holster is that sand/grit might be able to make its way into the locking mechanism, utterly trapping the gun inside the holster. This situation is more likely if you engaged in combat on dusty grounds. Perhaps one of the most serious concerns about this holster have been about unintentional discharge. Often at times, when people draw their guns under stress, the trigger finger presses so hard on the button that it unintendedly engages the trigger. In August 2004, two trained personnels inadvertently shot themselves using the BlackHawk SERPA and Glock pistols. One victim lost a 10cm piece of her femur while the other one also damaged the same area with an unintentional misfire during non-lethal training ammunitions in a force-on-force event in April, 2005. BlackHawk was contacted and concerns were raised. The company insisted that it was not aware of any outstanding issues regarding the holster’s design and that product had been ‘thoroughly tested by law enforcement and military personnel’. In October 2005, during a force-on-force evolution, a student tried drawing a NLTA-modified Glock 17 from his BlackHawk SERPA, but was unable to free his gun from the holster even with one person applying full force at the release button. It was later discovered that a very small piece of gravel equivalent to the size of a pin’s head had made its way into the holster’s release button, wedging the lock firmly in its place. The gun was finally released but at the cost of the entire holster popping off the belt and the three belt plate screws slipping off. 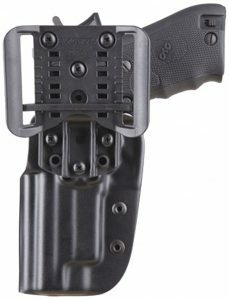 Critics argued, of what use is a retention holster that is not capable of keeping the gun on the belt? Having proper trigger finger discipline is central to using the BlackHawk SERPA. Try to keep your finger straight and use the pad of your finger to engage the release. This will ensure that your finger remains straight and out of the trigger guard while drawing the firearm. Poor finger discipline is the primary issue if you plan on using this holster. Most people try disengaging the retention with the tip of their finger due to which their finger is bent and easily slips into the trigger guard, causing accidental fire. Critics argue that if the user has to train himself around the shortcomings of the BlackHawk SERPA, how could the holster be? Some critics argue that the Blackhawk Serpa Active Retention holster has a severely flawed design. Its security advantage is purely theoretical and not offered in practical usage. Moreover, the holster can not hold up with realistic training which happens to be very rigorous in nature, and only effectively masks the very real possibility of an unintentional discharge. Holster fits nicely but contains excess material and is too oversized to accommodate a FNS longslide. There are no instructions regarding properly installing the paddle retention hooks. Each IMI defense product is developed in Israel in a manner that satiates the most demanding needs of its buyers and the military community in general. IMI’s brand has received a warm welcoming among Israel Defense and Police forces’ elite units. 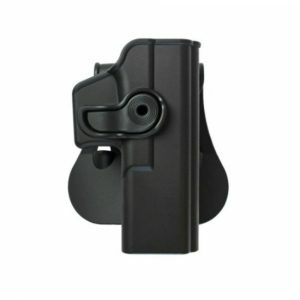 The IMI defense holster is crafted from a durable black polymer. It has fine contouring combined with features that enable maximum comfort. More importantly, the holster sits exactly where your trigger finger normally slides down at The Ready. Half the price of BlackHawk products and works just as well. 360 degrees rotation for cross draw etc. 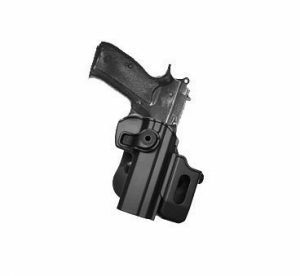 One of the most salient features of this holster is that it has an offset feature which allows for greater positive indexing by vertically positioning your pistol slightly away from your body. This gives a better outward cant. The Blade Tech OWB also has a ‘drop’ that grants you easy access to your pistol by placing it relatively lower on the body and allowing the arm to remain more extended. Perfect for the ladies, this holster is very popular for range work. It is customizable for three different cants: Muzzle Forward, FBI cant, and Straight Drop. Lastly, the belt loop accommodates customizing the belt’s width according to your preference. The shim can be moved to different slots on the loop widening or narrowing the belt’s width. 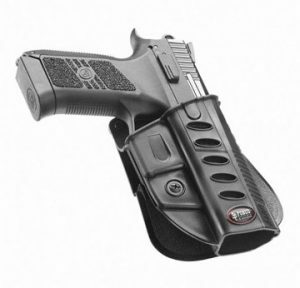 This holster’s passive retention systems enables efficient quick draw. The Fobus incorporates a mechanism which acts like a spring on the area of the trigger guard, holding your firearm firmly into place. The Fobus is perfect for CZ 75 P-07 DUTY & P09 given the fact there aren’t many holsters available for these models. Best fits CZ 75 P-07 Duty & P09. Holster material includes injected RX18 Polymer formula. Firearms remain firmly in holster, BELT holster . This polymer retention roto holster is a best fit for CZ 75 SP-01 Shadow, CZ75 SP-01 Tactical, CZ75 Compact, CZ75D Compact and CZ 75 Tactical Sports. It has a comfortable contoured fit with good retention for effective disengaging and an adjustable cant suitable for most users. Locks gun in tightly. Comes out smoothly. All in all, the BlackHawk SERPA is the clear winner of this roundup if you are looking for a well-rounded holster that offers both superior tactical combat and adequate concealment. The aforementioned alternatives do offer these same advantages, but given the price difference of the BlackHawk and the alternatives, it seems clear that the BlackHawk is the obvious winner. The brand name, the holster’s great features along with its inexpensiveness make the SERPA a stunning tactical holster. However so, everyone has their own preferences, so you ultimately make the final call on what you need to get. I need a level 2 holster for a vs 75 sp-01 tactical with raised sights and suppressor length barrel.Do you have this item. Extremely poor selection for any one needing a level II or Level III duty holster. How can anyone call passive (friction) a form of retention. Beat the crap out of me. In a fight for your weapon passive retention will not save your life. I would not trust my life with any of their choices. It seems that no one except for one manufacture makes a good level III holster. I had to buy mine from a Czech manufacture. It comes with three forms of active retention. The outer side one is totally customizable between two levels of active retention and two levels of passive retention. I changed my to the highest level of passive because I do not like the way the finger ends up so close to the trigger as your draw. It is worst than the Serpa. But I am OK with two active and one passive form retention. All the levers can be easily changed from right handed to left handled. Which is great for those who need it. The only con is that it does not feel as sturdy as the Blackhawks and other duty holsters made in the US, but I’ve had it for two, going on to three, months. I go in and out my patrol car several times during my shift, it has gotten banged up here and there, and no problems what so ever. In fact, I think that it being more flexible than the US holsters makes it even more comfortable as my firearm can adjust to between my body and the seat shape. So far so good! I am about to order the tactical version with the leg strap. If it wasn’t for this Czech manufacture I would not be able to use my CZ as my duty weapon. US manufactures have miserably dropped the ball on Cz owners that use their Cz firearms as duty weapons.